Meet Gabi Hartman, LSY! teen reporter – Live! Starring ... You! That concept of having teens doing interviews with people in the spotlight was so popular that I kept it going, and it’s grown into the LSY! program you see today. Other than connecting on Facebook, however, Gabi and I didn’t keep in constant touch. She lived hundreds of miles away in Charlotte, North Carolina. While I was building up LSY!, she was finishing up high school. We reconnected, though, when Gabi came to New York City for her freshman year at NYU. She got in touch to talk about her aspirations as a singer, and ultimately ended up enlisting as an LSY! teen reporter, too! 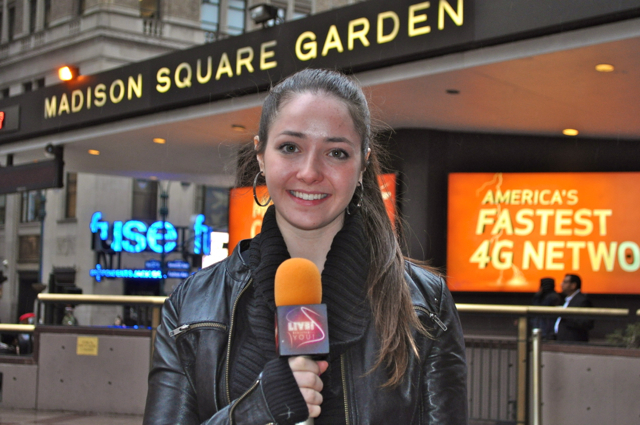 Gabi’s first interview was with New York Rangers goalie Martin Biron at Madison Square Garden. That was personal for her, because Gabi’s dad, Mike Hartman, won a Stanley Cup with the Rangers when she was just a baby. It’s always cool when things come full circle, whether it’s “performing” at MSG like your dad, or helping start an innovative program and then getting a chance to be involved with it again. But for Gabi, this is just the beginning: I know we’ll be reading and watching more great interviews (and hearing some awesome music) from her very soon! Key fashion item: shoes, shoes, shoes! What she’d need to survive on a deserted island: Pictures of family, endless supply of chocolate, and a piano. (I don’t play but I’d LEARN). Biggest inspiration: My dad. He taught me to chase dreams. Unexpected New York City reality: The amount of smoke people blow into your face and the backbone you need to learn to have in order to tell them not to! Biggest misconception of living in the south: That we like sweet tea, bacon, and grits. I don’t – ew! Also, I am a vegetarian and bacon is by far the worst food I can imagine a person eating! Strips of pig roasted in its own fat? Really, people? Favorite TV show: I can quote every episode of Friends. I have the collector’s edition box set! Also, I don’t care how cliché this is: I LOVE TITANIC and my heart will go on forever for Jack Dawson. It was the first movie I saw in theaters and it is amazing.